A dog and its handler walk along a pressure-sensitive walkway. Photo: Emma Thomson. Researchers at the University of Saskatchewan’s Western College of Veterinary Medicine (WCVM) are taking tips from the field of human medicine and rehabilitation to develop a technique to help detect and diagnose injuries in dogs. Gait analysis, pressure walkways, and angled walking are popular techniques used in human medicine. Their use has improved prosthetics, rehabilitation, medicine and more. But, while this research has a long history in human diagnostics, it is relatively new in veterinary medicine. Dr. Romany Pinto, a clinical associate in rehabilitation at the WCVM, hopes similar research in dogs will lead to a non-invasive, quick and easy technique that aids in diagnosing lameness in dogs. In 2017, she noticed that some dogs with muscle-strain injuries did not limp nor otherwise show lameness on flat surfaces, but were visibly lame when they walked across a ramp. “This led me to start a research study that would investigate what happens when healthy dogs and dogs with hind-limb injuries walk up and down [a] ramp,” she says. She proposes that walking dogs on an incline and decline exaggerates subtle injuries that cause lameness, making the injuries easier to detect and diagnose. The study is designed to get at the mechanisms underlying the gait patterns, specifically focusing on stance time (the amount of time the limb is on the ground as a proportion of stride time), stride length (the length each limb moves in a stride), and limb force of healthy and lame dogs to increase the precision and accuracy of the diagnoses of subtle injuries that can cause dogs to become lame. Lameness is a common problem in dogs; it can be caused by illness or injury. However, if the problem does not noticeably change a dog’s gait, it can be easily missed. Moreover, mild injuries that cause lameness can be hard to detect using today’s standard veterinary diagnostic techniques. Veterinarians diagnose lameness by watching the animal walk and by feeling its bones, joints and limbs. The veterinarian typically observes the animal walking on a flat surface, such as in a hallway, watching for a limp or stagger. In equine medicine, veterinarians will run horses at different speeds and in circles. Also, equine veterinarians commonly use other tools and techniques to help identify lameness including stressing the joint and nerve blocks. After a distance exam, veterinarians feel the animal for areas that are swollen, painful or inflamed, and assess the limb range of motion. Sometimes, they also obtain X-ray or ultrasound images of the affected limbs. But mild injuries often go undetected. Past research has shown that when an animal walks up or down a ramp, hill or stairs — exercises often used in rehabilitation — the angles of the animal’s joints and limbs change. Walking up a hill, for example, causes hips to bend (flex) more and knees to bend less, while walking downhill causes hips to bend less. In addition, incline and decline walking changes how weight is distributed among the limbs. If researchers were to extrapolate current knowledge about lameness and injuries — if an animal is lame on one limb — it will put less weight or force on that sore limb because it is painful. Walking on a ramp shifts the weight of the animal, which challenges the dog’s ability to reduce the stance time and force exerted by the sore limb. This change in weight distribution might exaggerate the lameness and make it more easily noticed and diagnosed. 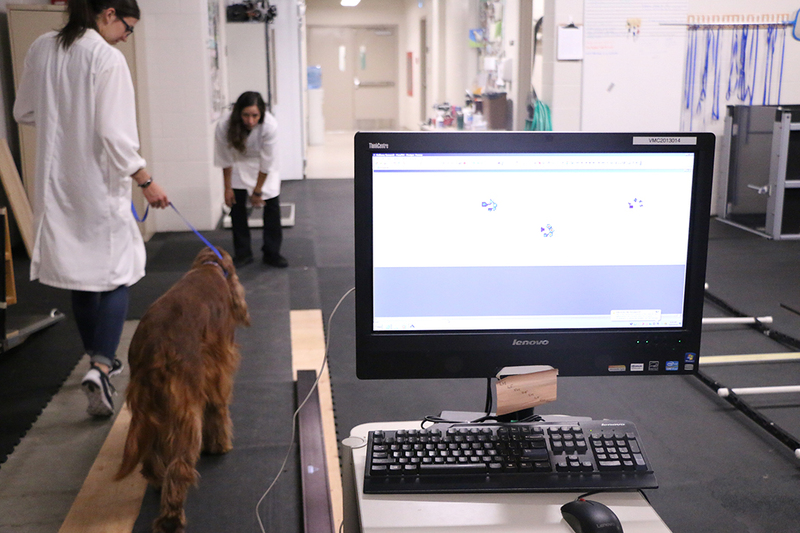 To gather the necessary data to identify and describe these gait changes in both healthy and lame dogs on flat, inclined and declined surfaces, Pinto’s team at WCVM is using a pressure-sensitive walkway. The walkway is a mat with embedded sensors that detect and measure subtle differences in kinetics as an animal walks on it. Capturing the kinetic data of the dog’s walk allows the researchers to analyze the stance time, stride length, and pressure changes that occur. Some clinics use the walkway on the flat surface to diagnose lameness by comparing the forces exerted and timing changes by each paw as the animal walks across the mat. The WCVM study is the first to use the walkway to measure and describe how animals — in this case, healthy dogs and dogs with hindlimb lameness — move on inclines and declines. 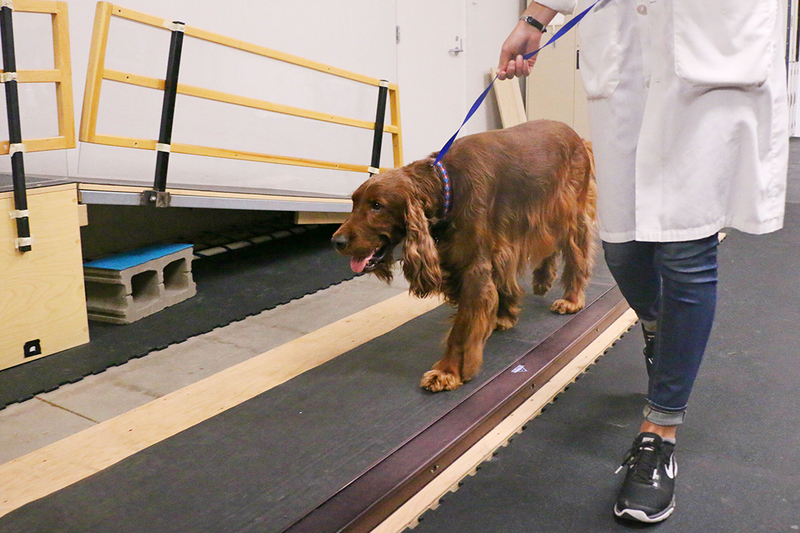 By studying the gait changes in healthy dogs on the ramp, the team seeks to determine the parameters that represent normal, healthy gaits. Information obtained from healthy dogs would provide benchmark data to help researchers and clinicians better identify and understand the gait patterns associated with subtle injuries. The research to date has determined that when walking uphill, dogs shift their weight to their hind limbs, with their hind limbs spending more time on the ground during each stride than on flat surface. The opposite happens when a dog walks downhill: the weight shifts to the dog’s fore limbs and its limbs — the hind limbs, in particular — spend less time on the ground during each stride. The study has found that lame dogs distribute their weight in similar patterns — shifting weight to their hind limbs on incline and to their fore limbs on decline, but reduce the force of the injured hind limb and its time spent on the ground. The researchers hypothesize that when an injured dog walks on a decline, the dog’s ability to compensate for the injured limb causes specific gait changes that accentuate the lameness. Pinto and Muir hope the study leads to a better understanding of the diagnostic tools and techniques that veterinarians use to more easily diagnose lameness, as well as advance rehabilitation in injured dogs. Emma Thomson is a student at the University of Saskatchewan’s Western College of Veterinary Medicine. She wrote this article as part of Science Borealis’s Summer 2018 Pitch & Polish, a mentorship program that pairs students with one of Science Borealis' experienced editors to produce a polished piece of science writing.